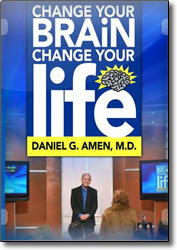 Dr. Amen’s SEVEN simple principles to change your brain and change your life. The ONE question you should ask yourself everyday if you really want to be successful in your life. Tips on how to be happier, more focused, less anxious and less depressed by balancing three important brain systems. A sneaky “brain based strategy” to deal with the most difficult people in your life. Clear, concise and effective strategies to make your brain great. TWELVE brain-healthy foods everyone should include in their diet. Filled with “brain prescriptions” (among them cognitive exercises and nutritional advice) that are geared toward readers who’ve experienced anxiety, depression, impulsiveness, excessive anger or worry, and obsessive behavior, Change Your Brain, Change Your Life demonstrates the strong link between brain and body. Dr. Amen advocates nutrition, natural remedies, including deep breathing, guided imagery, meditation, self-hypnosis, and biofeedback for treating disorders that so often require medication and it’s associated side effects.